Britain’s Winston Churchill 2015 Brilliant Uncirculated £5 (KM-1298) coin won “Best Crown” for coins dated that year in the Krause Coin of the Year Awards. 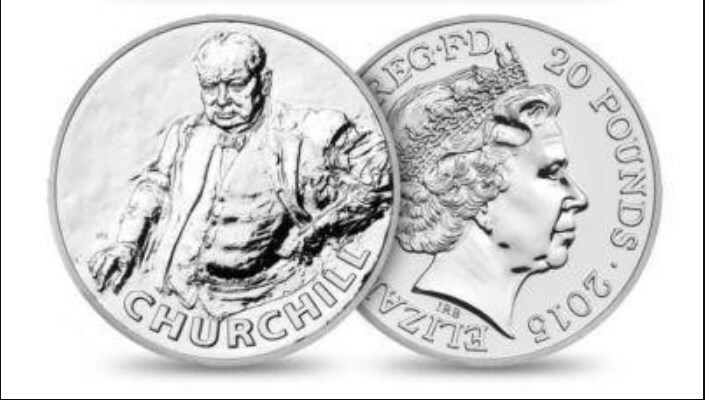 The Royal Mint released the coin to commemorate the 50th anniversary of Churchill’s death. With the release of the 2015 coin, Churchill is the first statesman (non-monarch) to be featured on two British coins, according to the Royal Mint. The United Kingdom previously issued a circulating copper-nickel crown upon his death in 1965. Churchill is widely regarded as one of the most influential leaders of the 20th century. While he served as Prime Minister of the United Kingdom from 1940 to 1945 and again from 1951 to 1955, he is most well-known for leading the country during World War II. Churchill was also a distinguished soldier, war correspondent, statesman, and author. I wanted to capture something of Winston Churchill’s intensity, to create an active portrait, a sense of the man that you may have come away with had you met him. I thought the portrait created for the memorial coin in 1965 by Oscar Nemon couldn’t be bettered, so though I much admired it, I wanted to start afresh. I decided to create an image that is larger than the field of the coin – because this was a larger than life man, there was so much more to him than can ever be captured in one portrait. The edge lettering of the coin states: NEVER FLINCH, NEVER WEARY, NEVER DESPAIR. The quote is from a March 1, 1955, speech Churchill made before the House of Commons. The obverse features the Ian Rank-Broadley effigy of Queen Elizabeth II. The copper-nickel coin weighs 28.28 grams and measures 38.61 millimeters in diameter. It had a maximum mintage of 10,875. It is also available in silver uncirculated (KM-1298a) and silver proof (KM-1298a) with a mintage of 7,500 and as a specially made double thickness piedfort version.